Jez Butterworth’s The Ferryman at the Gielgud Theatre. 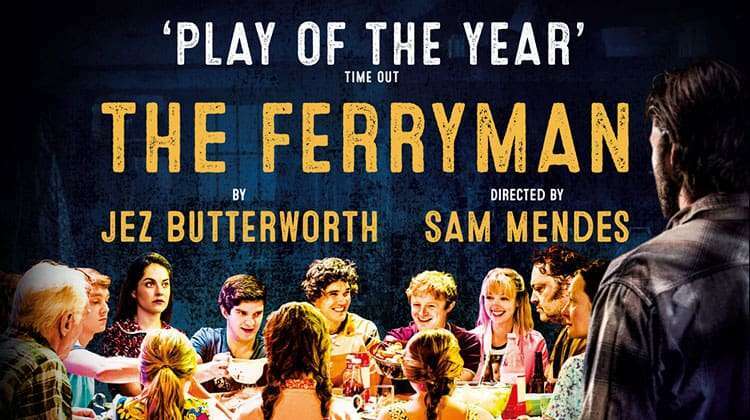 Following a sell-out run at the Royal Court Theatre, Jezz Butterworth’s highly anticipated new play The Ferryman will transfer to the West End’s Gielgud Theatre. Directed by Sam Mendes ( SkyFall , Spectre ), The Ferryman is set in rural Northern Ireland in 1981, the height of the troubles; a mighty family epic with generations of one family crammed into its dynamic world. The Ferryman runs from 20 June 2017 until 19 May 2018 at the Gielgud Theatre. The Ferryman, written by Jez Butterworth, directed by Sam Mendes, with design by Rob Howell, lighting by Peter Mumford and music and sound by Nick Powell. Why book The Ferryman tickets with us?